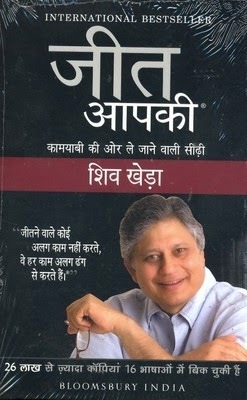 Jeet Aapki: Kaamyabi Ki Or Le Jaane Vali Seedi is an international best-selling self-help book authored by Shiv Khera. Jeet Aapki: Kaamyabi Ki Or Le Jaane Vali Seedi is translated to Hindi, from the original English book You can Win: A Step-by-Step Too, for Top Achievers. The author convincingly asserts that winners don’t do different things, but they do things differently. The book is witty and is easy to comprehend, as the author chooses a rather practical approach to address how ancient wisdom and contemporary thinking could be balanced in order to simplify ideals and drive out day to day life confusions. Shiv Khera’s positive words take the best examples from lives of men and women who have succeeded in all that they did, through sheer hard work and faith in themselves. The book is a standard for optimism and a staunch representative of the belief that one needs to really want to win, to succeed in life. Shiv Khera takes life’s little lessons and teaches us that helping others is helping ourselves. More than 26 lakh copies of this book have been sold and has been translated to more than 16 languages. Shiv Khera is an Indian author of self-help books. He has penned four bestsellers: You Can Win, Living with Honour, Freedom Is Not Free and You Can Sell. Born into a simple business family, Shiv Khera worked as a car washer, a life insurance agent and a franchise operator before moving on to motivational speaking where he found his calling.